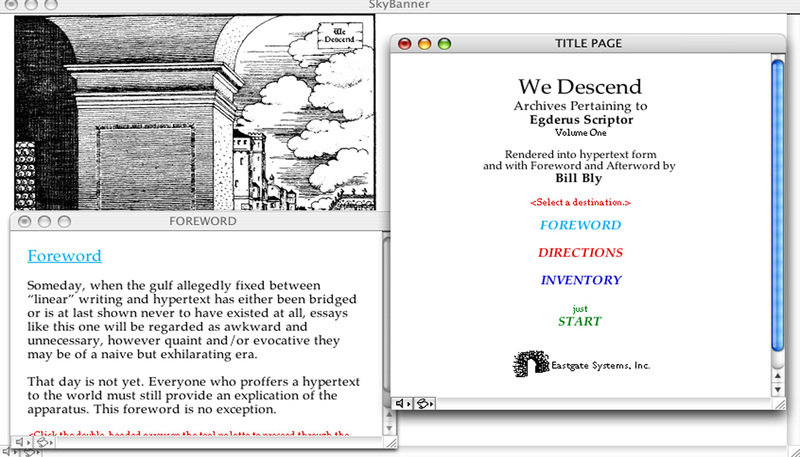 Copy published by Eastgate Systems, Inc. on 3.5in Floppy Disk in 1993. Currently in The Dene Grigar Collection. Grigar purchased this copy directly from Eastgate Systems, Inc. for use in the lab. Filed Under "Eastgate Quarterly Review of Hypertext Volume 1, Number 2". Published with Mary-Kim Arnold's "Lust". Contains a manual and floppy disk. The edges of the folio are lightly worn. Grigar purchased this copy directly from Eastgate Systems, Inc. for use in the lab. 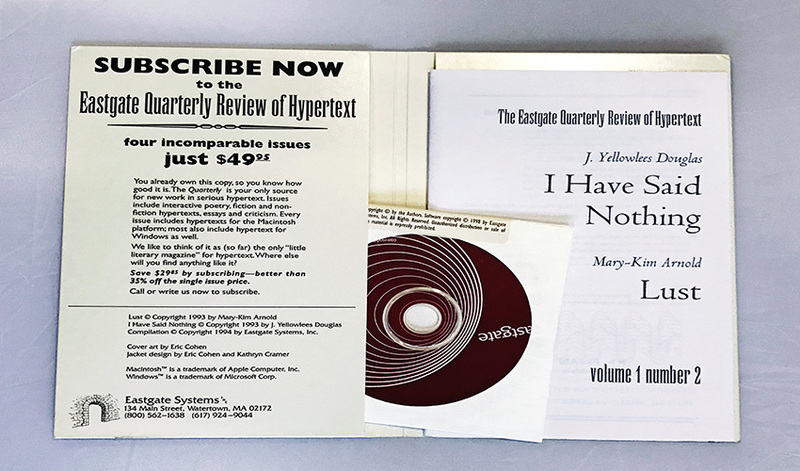 Filed Under "Eastgate Quarterly Review of Hypertext Volume 1, Number 2". Published with Mary-Kim Arnold's "Lust". Contains a manual, floppy disk, and advertisement card for Wes Chapman's "Turning In." This folio was opened specifically for the Wikipedia-A-Thon held in the Electronic Literature Lab on 10-20-2017. 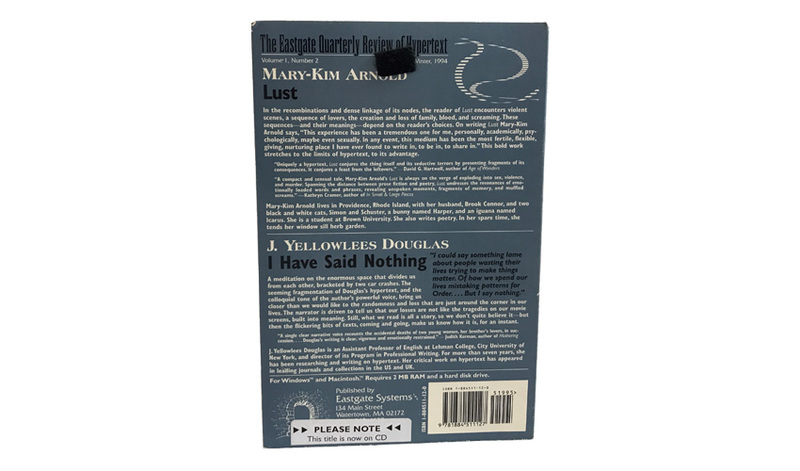 Copy published by Eastgate Systems, Inc. on CD-ROM in 1998. Currently in The Dene Grigar Collection. Grigar purchased this copy directly from Eastgate Systems, Inc. for use in the lab. Filed Under "Eastgate Quarterly Review of Hypertext Volume 1, Number 2". Published with Mary-Kim Arnold's "Lust". Contains manual and CD-ROM. The folio is lightly worn and creased on a few edges. The CD-ROM has a few light scratches. 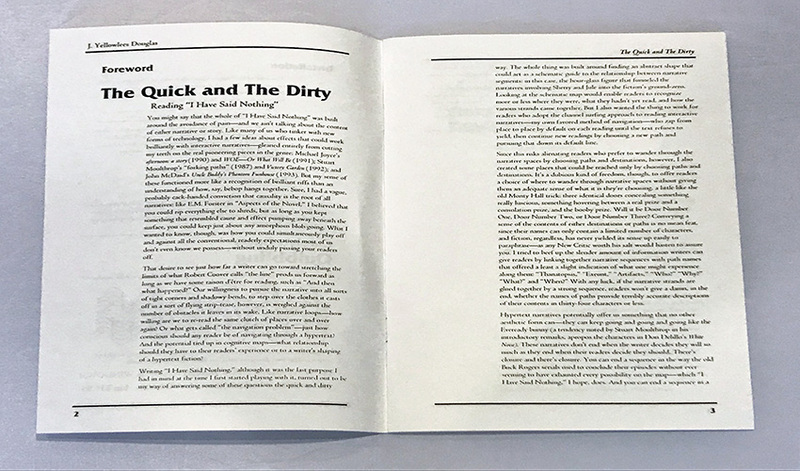 Grigar received this copy from N. Katherine Hayles for use in the exhibition, "Early Authors of Electronic Literature: The Eastgate School, Voyager Artists, and Independent Productions," that she curated for the Electronic Literature Organization 2008 Conference & Media Arts Show. Filed Under "Eastgate Quarterly Review of Hypertext Volume 1, Number 2". 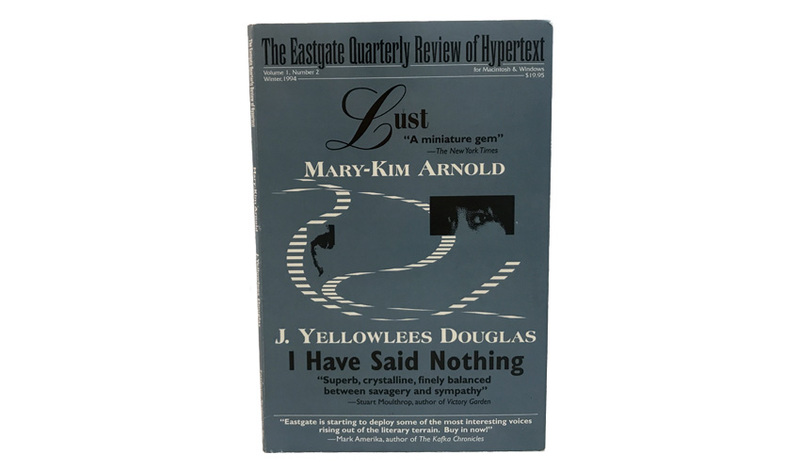 Published with Mary-Kim Arnold's "Lust". 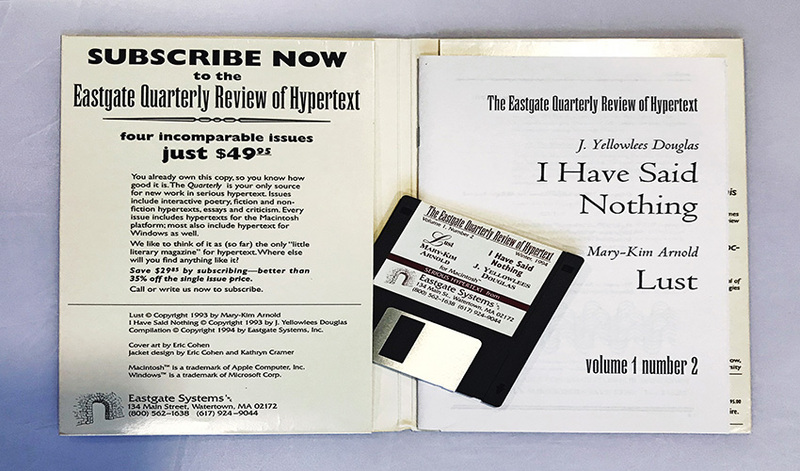 Contains a manual, CD-ROM, and advertising insert for other e-literaure published by Eastgate Systems, Inc., including Deena Larsen's "Marble Springs," John McDaid's "Uncle Buddy's Phantom Funhouse," Michael Joyce's "afternoon: a story." The CD-ROM is missing. The edges and fold of the folio are very worn. 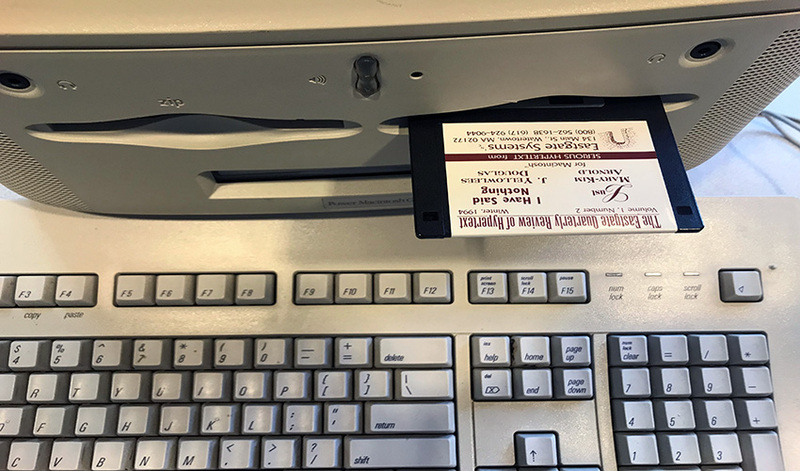 Grigar purchased this copy directly from Eastgate Systems, Inc. with the intention of keeping it intact in long-term archive. Filed Under "Eastgate Quarterly Review of Hypertext Volume 1, Number 2". Published with Mary-Kim Arnold's "Lust". This copy is unopened and in mint condition. It is known from other copies in the library that the folio contains a manual and floppy disk. 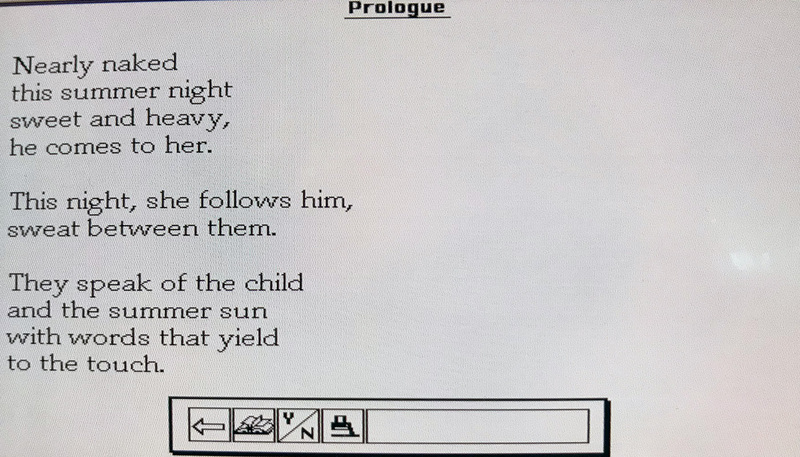 Copy published by Eastgate Systems, Inc. on 3.5in Floppy Disk in 1993. Currently in The Sarah Smith Collection. 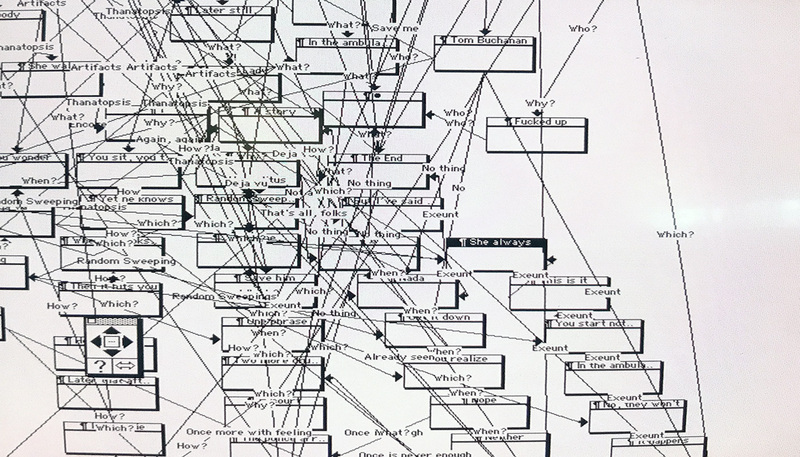 Grigar received this copy from Sarah Smith for use in the electronic literature lab in 2017. Filed Under "Eastgate Quarterly Review of Hypertext Volume 1, Number 2". Published with Mary-Kim Arnold's "Lust". Handwritten label. "Bracketed by two fatal car accidents, 'I Have Said Nothing' is a meditation on the enormity that divides us from others. Douglas explores the interaction between the fragmentation inevitable in hypertext and the causality necessary for the creation of story; she says, 'I had a vague ... conviction that causality is the root of all narratives: like E. M. Forster in Aspects of the Novel, I believed that you could rip everything else to shreds as long as you kept something that resembled cause and effect pumping away beneath the surface, you could keep just about any amorphous blob going.' The result is a tough, hard-edged, look at how we fragment ourselves to avoid pain, to avoid the inevitable -- death." --Eastgate Systems, Inc.